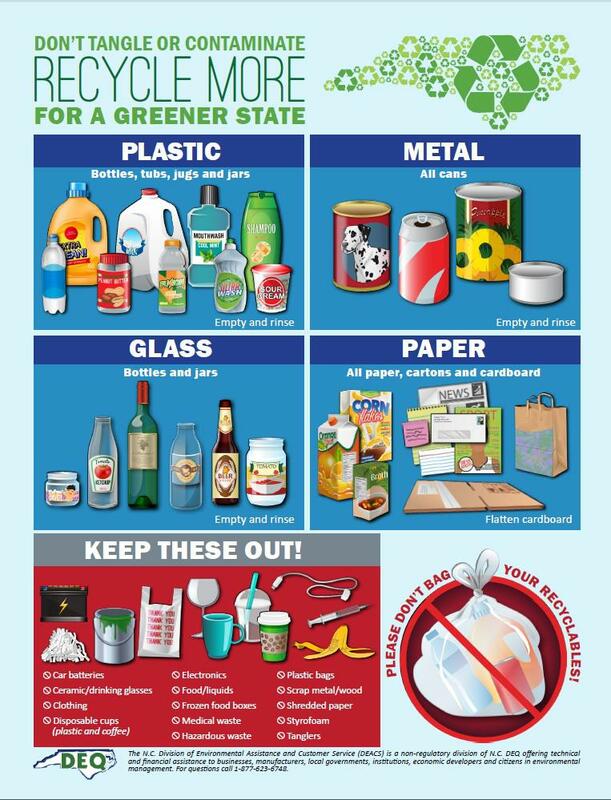 A poster of general, statewide accepted recyclable materials as described by the Department of Environmental Quality. If you've ever thrown out your recyclables in a garbage bag, you personally have contributed to the rising cost of recycling in America. Garbage bags aren't recyclable in conventional material recovery facilities (MRFs) and often get tangled up in the machines that sort your paper from your glass from your plastic. Then somebody has to go in, fish out that mangled plastic bag, and dispose of it properly. The same goes for textiles, scrap metal, electrical cords. The North Carolina Department of Environmental Quality is offering training, consultation, and digital resources to communities that want to streamline and clarify their messaging about recycling. That's because well-meaning people are tossing garbage in the recycling bin, and communities are having to pay more to clean up after them. Contamination in the recycling stream means more work on the back end, and that is one of the factors driving up costs, according to Wendy Worley, who runs the recycling section for the DEQ's Recycling Section. Worley doesn't blame you. She said she knows messaging about recycling standards can be confusing, especially since different towns and counties use different MRFs which have different rules, so they distribute information in different ways. "It's important to give consistent messaging so that there's less confusion about what goes in the bin for recycling and what is actually trash," Worley said. "So, that consistent messaging goes a long way in really helping the public understand and really simplify that message." The Division of Environmental Assistance and Customer Service (DEACS) has created free outreach materials to help local governments offer a clear message about proper recycling to cut down on conramination. They can also customize materials for you. "What that gets for a community is a decreased cost in processing, because the more material that doesn't belong in the recycling stream goes to the recycling facility, the more it costly it is to pull it out," Worley said. "So, it helps weather that storm of higher processing cost by sending material that they can actually manage." Worley said she and her team are happy to meet one-on-one with communities looking to forge a path forward.